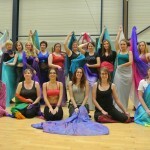 Bellydance by Johanna provides workshops for various occasions. We are available to teach any of the following belly dance workshops at your event. If there is a topic or dance style not listed below we can customize a workshop for your event. Most of the workshops are two hours in length and can be adjusted for a full day of learning and fun. We provide workshops for hen parties, birthdays, corporate events and restaurants in which we learn the basics of the dance. This even can be done during luchtime ! We work with various concepts for bellydancers : introduction, combination and drills and choreography. This can be done with our without belly dance accessories like fanveils, veils, double veil, cane, isis wings, zills. 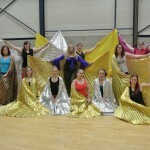 For example a 2 hours workshop introduction to double veil, followed by a 2 hours workshop choreography with double veil.